How Many Petals Are on a Jasmine? What Happens If You Eat Caroline Jasmine Flowers? What Soil Is Needed for Jasmine Plants? Jasmine is a flowering plant. Its blossoms are beautiful and they emit a delicate fragrance that is often extracted as an essential oil. If well watered and fertilized, jasmine is easy to grow in a home flower garden. But while relatively hardy, jasmine is susceptible to a few diseases. Jasmine plants affected with leaf blight develop red-brown circular spots on their upper surface. The infection spreads rapidly, especially during the rainy season. And as it progresses, infected leaves curl and dry at the margins. In severe cases shoots, buds and young branches dry out as well. Leaf blight severely reduces flower production, but is not dangerous. Spray affected plants with bordeaux mixture to control the disease. According to the University of California's Integrated Pest Management Program, bordeaux mixture is a fungicide and bactericide that has been used for decades to control diseases of tree fruits and nuts, vine fruits, and ornamentals. Rust affects all parts of the jasmine plant, coloring it with yellow-orange pustules. As the disease progresses, infected plant parts become distorted. To control rust, prune affected tissue and follow with a copper or sulfur spray. Jasmine plants affected with this disease wilt in sections. 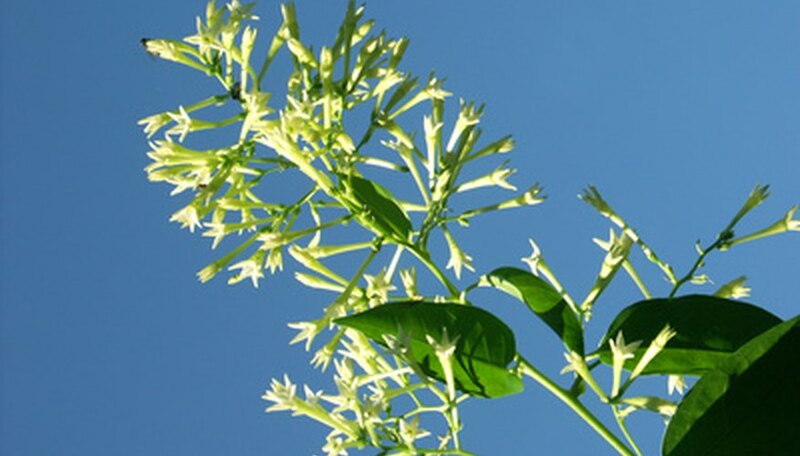 Wilt slowly kills the root system of the jasmine, starving the plant of essential nutrients. Uprooted jasmine plants with wilt show roots that are blackened in patches and girdled with the white mycelia that causes the disease. To kill wilt, treat the soil with bordeaux mixture. Wait until the flowers have stopped blooming. This varies among Jasmine varieties, but generally the flowers stop blooming in the fall. Use clippers to thin out the plant. You do not have to cut Jasmine back to the ground. Instead, thin out the growth by clipping several vines in an overcrowded area. In addition, cut back the overall height by several feet if it is getting too high. Prune Jasmine vines, such as the common white Jasmine (Jasminum officinale), often if you are trying to use it as a bush. You do not need to wait until it is done blooming to prune. Cut a Jasmine plant back to ground after flowering only if the plant becomes infested with spider mites. Pick up all the cuttings and throw them out. After cutting back, fertilize the plant with a balanced fertilizer labeled 10-10-10. Place a wooden trellis somewhere in your yard, patio or balcony. If you are tight on space, you can secure it to the wall on a patio so it is not on the ground and is out of the way. Plus, once it starts blooming, it will add a pretty touch to your outside area. Make sure the trellis is in full sun to partial shade. Plant the jasmine seeds 6 inches apart in the ground in front of the trellis or in the plant pot you have provided under the trellis. Over time, the jasmine vines will crawl up onto the trellis. Water every other day, and in moist climates, water accordingly if rain is available to the plant. Pruning is not necessary until about a year after jasmine is planted, and you will already have blooms within a couple of months. Pick the white jasmine flower blooms once they have opened on the plant. The best time to pick blossoms is after the sun has been up for at least 2 hours, but before the heat of the day. Mash the flowers together in a bowl to release their essential oils. Rub them together and mash them up with a spoon or your fingers carefully. Do not rip them up. Boil water for the tea. For every cup of water, add 3 teaspoons of the jasmine blossoms. You can either add them to the teapot after the water has boiled or place them directly into your mug where the water will be poured. Combine the water and the jasmine. Let the jasmine steep in the tea for 10 minutes to extract all of the herbal remedies and nutrients. The trumpet gentian is a perennial wildflower that is abundantly scattered among the fields and prairies of Northern Italy. The plant is a low-lying ground cover that produces several short vines that bloom with deep royal purple to indigo blue-colored petals. The glacial buttercup is a relative to the standard buttercup plant that is often considered a pest in North American gardens and lawns. The difference is the luscious opened flowers with petals of snow-white and canary yellow. The leaves of the glacial buttercup are succulent and bulbous, and the plant is often seen blooming in rocky areas near the Alpine mountains of Italy and other cold regions. The bougainvillea plant is a tropical, low-lying shrub that can be seen blooming with vibrant fuchsia-colored petals along the Mediterranean coast of Italy. It is also a popular garden and patio plant throughout the world in warmer climates. 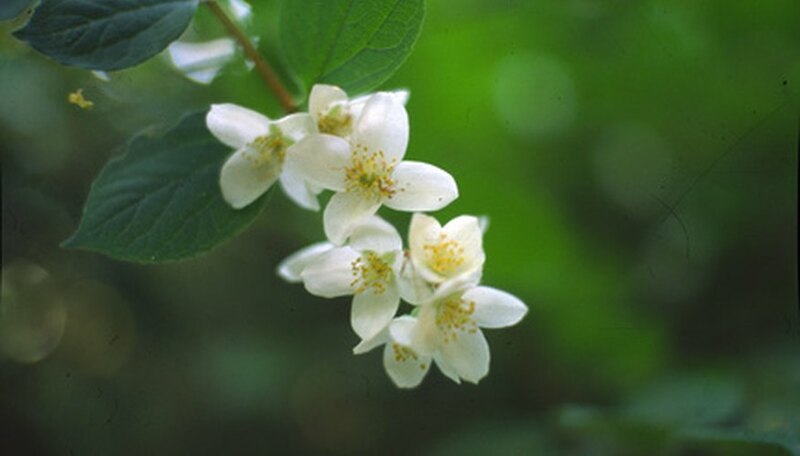 Jasmine is commonly seen growing indoors, or in containers on shaded patios throughout Italy and other warm climates near the Mediterranean region. 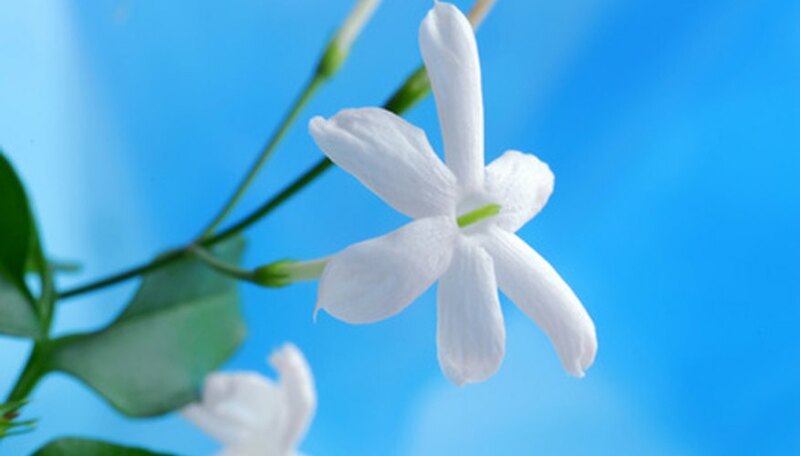 There are many types of jasmine, and it is a highly aromatic plant that is prized for its essential oils. The Mid-Florida Research and Education Center notes that R. Black and K. Ruppert, authors of "Your Florida Landscape," suggest that fertilizer for Asiatic jasmine should contain a pound of nitrogen for every 1,000 square feet. They recommend applying the fertilizer every three to four months until the groundcover is established and then annually in the spring. Selecting jasmine for a privacy hedge depends on your needs and growing conditions. Common jasmine, which grows to 30 feet, works best as a vine unless you pair it with a trellis. Winter jasmine is hardier and of a more manageable height, but the flowers are not as fragrant as common jasmine. Italian jasmine has both height and fragrant flowers. Star jasmine, while technically not a jasmine plant, also makes a good shrub for privacy hedges. Pick out a location near the roses to plant the jasmine shrub. Use a rake to open up the ground about 5 inches down. Remove any large rocks, dirt clods or roots. Mulch the area. Place a stake about 6 inches from where you want to plant the jasmine shrub; make sure it is securely in the ground. Dig a hole with a shovel next to the stake that is around 6 inches deeper than the jasmine plant's root ball. Fill the hole with 2 inches of loose dirt. Place the jasmine root ball carefully in the hole. Backfill the hole with the dirt you dug from the hole. Pat it down with your hands securely around the root ball. Make sure the dirt covers the root ball up to the base of the jasmine plant. Wrap a piece of cheesecloth around the middle of the jasmine seedling stem and wrap the cloth around the stake; tie a knot to securely attach it. This is to support the jasmine plant. Water the jasmine and the roses at the base of the plants until wet but not soggy once you are done planting the jasmine, as the stress from shifting soil may affect both plants. 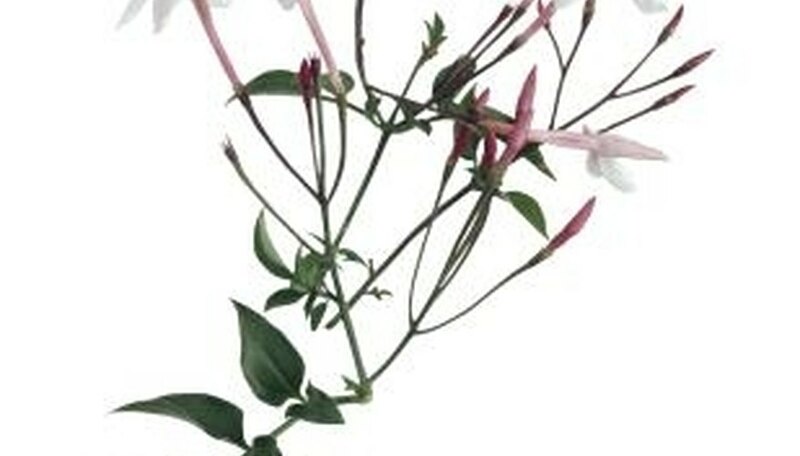 Gather a bundle of jasmine blossoms and snip the foliage from the sprig on which they are blooming. Don't snip the woody stem of the blossoms. Insert the jasmine, blossom side down, into the paper sack. Allow the stem of the flowers to protrude from the top of the sack. Secure the rubber band around the top of the sack and the stem of the jasmine blossoms. Make sure the blossoms of the jasmine are not touching the bottom of the sack. Poke a few small holes near the bottom of the paper sack. This provides a way for the air to circulate through the bag to dry the flowers. Allow the jasmine and paper sack to sit undisturbed in a dry area for up to a week. Mow on the lowest mower setting over the jasmine ground cover a couple of days before initiating the killing process. Soak the entire area in water with a sprinkler or hose the day before you plan to eradicate the jasmine. This will soften the plant's roots and soil, making it easier to uproot and kill. Start on one end of the area, firmly grasp the jasmine by the base and pull up with force, doing your best to remove all roots and runners. Immediately after pulling up the jasmine, place it in a bucket or large bin. Remove as much of the jasmine as possible. Return to the starting point where you began to pull up the jasmine. Dig up a couple inches of soil to remove any root particles, runners or pieces of the ground cover that may have been missed. Add these fragments to the bin pile. Rake over the entire area one more time to make sure you have removed all parts of the ground cover. Discard or burn any jasmine pieces or place in a compost pile. Jasmine (Gelsemium sempervirens), also called jessamine or Carolina jasmine, is a fast-growing vine with yellow, five-petaled flowers, according to Floridata. The Confederate jasmine (Trachelospermum jasminoides) has white flowers and also has five petals. 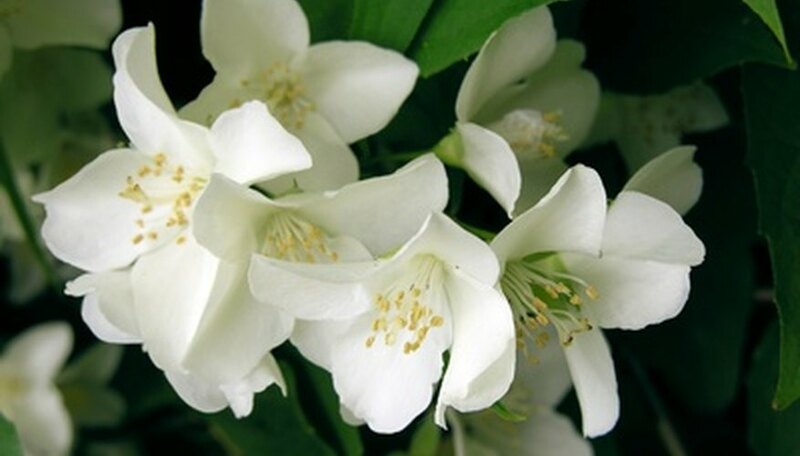 One popular type of jasmine, Arabian jasmine, has 1-inch-wide white flowers that develop in clusters of as many as 12 flowers in one grouping. Arabian jasmine is very fragrant and as the summer progresses the flower turns pinkish. The many species of jasmine flowers have various points of origins, with some cultivated for so long that where they came from is impossible to determine. The Star jasmine is native to parts of New Guinea, while Arabian jasmine probably comes from the Indian subcontinent. Jasmine flowers symbolize desirable traits such as elegance, grace and modesty, according to the Living Arts Originals website. The jasmine vine or shrub is an easy plant for gardeners to grow, requiring moist soil and warm temperatures to thrive. Confederate jasmine grows on a long vine and is a five-petaled white bloom that resembles a pinwheel. Despite the name, indicating it is from the Deep South, it actually comes from China. Gelsinium triggers a range of externally visible manifestations of poisoning, including the face becoming strained, the drop of body temperature and the skin taking on a cold, moist feel. The pulse will be rapid, but weak and irregular. Pupils will become dilated, double vision can occur and the eyelids will partially close. The jaw can also go slack due in part to the severe muscle relaxation. Carolina jasmine will immediately upon ingestion slow the respiration process or breathing. It blocks communication with and activity within the respiratory center of the medulla. As the poisons effects progress and respiration slows, consciousness can be lost. Respiratory failure and subsequent cardiac arrest is the physiological cause of death by Carolina jasmine poisoning and can occur within an hour to seven hours of ingestion without treatment. Locate a healthy branch near the lower part of the Chinese star jasmine plant. Identify a branch that is flexible and long enough to easily touch the ground. Scrape a thin layer of bark, using the tip of a sharp knife, from the bottom side of the stem about five to six inches from the stem's tip. Loosen the top 2 inches of the soil with a trowel where the stem will contact the soil. Bend the stem over. Remove the leaves in the area where the stem touches the soil. Secure the stem to the ground with a heavy rock or a bent wire. Cover the stem with a 2- to 3-inch layer of compost or mulch, which will help keep the stem damp. Water regularly to keep the soil slightly moist at all times; never allow the soil to dry out completely. Allow the stem to remain in place at least until autumn. Cut the new Chinese star jasmine plant from the parent plant in autumn, or wait until the following spring. Dig up the new plant, along with the surrounding soil. Plant the jasmine in its new home. Make sure to plant your purple jasmine in an area that has good drainage, and a sandy or loamy soil. Keep multiple plants at least 3 feet apart. Make sure purple jasmine plants get at least 4 hours per day of sun, and if the temperature ever drops below 50 degrees Fahrenheit, cover the plants to protect them. Water the jasmine only when the soil feels dry on top and about 1 inch down. Provide a wooden stake for newly planted or very young jasmine plants for a support system. Insert a wooden stake directly next to the jasmine, and loosely tie the jasmine stem to it with a plant tie or twine. You may need to support it in case of strong winds, or just to help train it in a certain direction to grow. Prune the purple jasmine plants every spring season. Use pruning shears or scissors to cut back any broken or dead branches or stems, and shape it how you desire (a climbing vine is the most common). Pinch dead flowers off throughout the year to encourage more bushy, full growth and blooming. All jasmine varieties, whether vines or shrubs, perform best in a warm and sunny to partly shady spot with moderately rich, moderately moist--but otherwise ordinary--garden soil. These often exceptionally fragrant plants benefit from regular pinching to keep them tidy. Clip the tips of the jasmine stems after flowering with pruning shears. Cut diagonally so the cut end of the stem is aimed toward the ground. Remove only the top inch of each stem. Remove any old, weak, or damaged stems by cutting them away from the plant at their base, keeping the cut diagonal to the ground as in step one. Cut the jasmine stems at their base if they are trying to take over structures or other plants. Attach plant ties to a trellis or fence line around new stems that want to control. Jasmine polyanthum, also called winter or pink jasmine, is a variety of jasmine plant vine that is noted for its extremely fragrant white flowers. It produces masses of blooms in late winter and spring. Place the potted plant outdoors in a sunny spot during the summer months. Bring the plant indoors in late fall before temperatures drop below 40 degrees Fahrenheit. Place it in an area that receives bright sunlight for its winter and spring resting period. Water your Jasminum polyanthum plant thoroughly about once a week during the summer and fall, keeping the soil slightly moist at all times. Reduce watering to once every 10 to 14 days during the winter and spring, allowing the soil to dry out between applications. Feed the plant twice monthly in spring through fall with a high-phosphorus fertilizer formulated for flowering plants. Apply according to the manufacturer's directions for the best results. Stop feeding the plant in winter during its dormant period. Prune Jasminum polyanthum in spring to remove wayward branches and promote a bushier growth habit. The plant can tolerate pruning to within about 6 inches of the soil surface. Repot after pruning if the plant has outgrown its container.